Alanna from Loomio met up with Michel Bauwens in Berlin, while both were participating in a conference about “Capital for the Commons”. They managed to slip out for a few minutes so Michel could tell Alanna about his experience using Loomio with the P2P Foundation, which he founded. 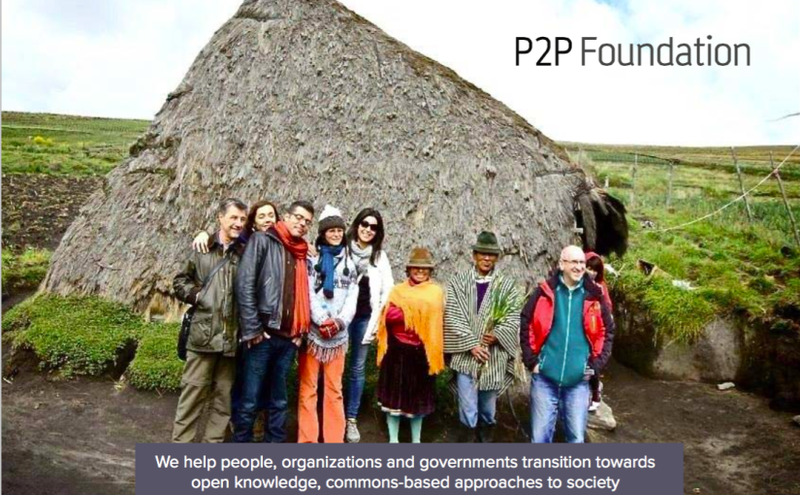 The P2P Foundation is a global network of researchers in open design, open hardware, free software – all kinds of systems that are open to contribution and create a common resource. They build collective knowledge, and explore how to develop livelihoods in a new social and economic paradigm. The P2P Foundation team members are individually extremely productive, and skilled at working autonomously. They continually deliver value when collaborating in a format like a wiki. But they found that decision-making about taking collective action was different. When we have to do things together that really require more high-level coordination, and more detail, we tended to turn in circles. They found themselves having discussions that would not reach a clear conclusion. Then six months later, the same topic would arise again. Certain activities with more complexity proved hard to coordinate informally. Loomio helps us to say, ‘We discussed this. We came to an agreement.’ It’s easy to use, and allows us to work in a non-hierarchical way? ?without being chaotic. Making a decision on Loomio makes it legitimate, and allows the group to clearly delegate responsibility for execution. Those carrying out the implementation know the whole group is behind them. You get a mandate from your community— that’s what I like about it. For Michel, the most important thing about Loomio is that it’s useful. This is why he’s seen it spread virally throughout peer-production communities, without the need for marketing. It resonates because of what he calls values-sensitive design. Our values — our democratic values —are in that software. Despite being the foremost librarian and chronicler of open-source collaboration practices, Michel himself is a researcher, not a technologist. Yet he finds Loomio to be user-friendly. I’m not so tech-oriented. For me, it’s a tool. I want to be a driver; I don’t want to be a mechanic. I never had any issue with Loomio. The P2P Foundation uses a large range of digital communication tools, producing an extensive wiki and an online magazine, along with blog posts, videos, and other kinds of web media. But they found that decision-making is something that requires a purpose-designed tool to be effective. Talking together, we could already do. But the combination of talking together and decision-making is what Loomio has. From his vantage point, Michel sees Loomio as part of a much larger movement toward permission-less collaboration, open cooperativism, entrepreneurial coalitions, and commons communities. My dream is that Loomio is just one of a set of tools that could be used by these new productive communities. There should be a library of tools that don’t compete for the mass of people who want to entertain themselves, but are really for serious people who are producing common goods. Loomio is going to be a core to their tool set. Michel recently came to visit Loomio during his New Zealand speaking tour. He calls himself “the librarian of the movement,” traveling the world connecting diverse groups working in highly collaborative P2P ways. Alanna is a co-founder of Loomio and a director of the Enspiral Foundation. She's passionate about innovating processes, technology, and structures for positive social impact.